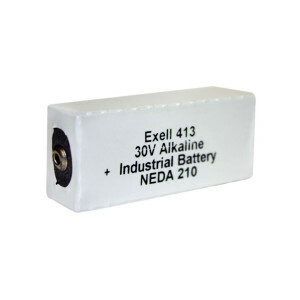 The Exell Battery 413A (Eveready 413 or BLR123) is an Alkaline replacement for the once-popular Carbon Zinc battery that was commonly used in VOM’s (Volt-Ohm Meters – an analog meter that reads Voltage, Ohms, and Milliamperes), like the Triplett 630. Being Alkaline, the 413A replacement will last longer than the original. It is widely used in vintage collectible transistor radios, as well as in the British Army Radiac Survey Meter Mark II, and other bizarre machines, such as the Minifon portable wire recorder. This battery is used by company’s like Gooch & Housego.